Confused by Japan's train system? All you need to know about Tokyo's Japan Rail (JR), Metro and Subway is here, from buying tickets or passes to changing lines. 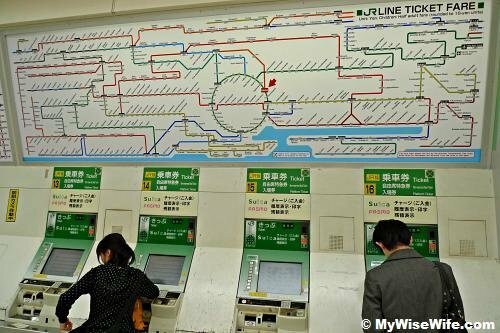 This is an all-in-one guide to using the JR and subway commuter trains in the Tokyo area, covering EVERYTHING from how to buy a ticket to how to get on and off the train. You’re going to Japan! Congratulations. You will be spending 70% of your commuting time on a train. This, I hope, will be an extremely helpful guide you use to learn how to ride the trains properly in Tokyo. This guide will cover the whole process: getting to the station, buying your ticket, how to get on the train, etc. Hopefully it has all the answers to your burning questions, such as: how do I buy a pass so I don’t have to pay for a ticket each time? How do I differentiate between the kinda-red line and the super-red line? How do I switch lines without looking like a complete and utter tourist idiot? Can I ride the JR and the subway? Oh my God, there’s a subway? (There is a subway. At some point, you might get on it. Don’t be afraid, you can do it! ) When there’s a train delay because of jinshin jiko, does this actually mean that someone killed themselves? Wait, people kill themselves on the train tracks!? Wait, what do I do if there’s a train delay? The guide is separated into 3 parts: the JR, the metro and an FAQ, which is really just a list of questions I came up with myself. I’m not that sure if they are frequently asked, if asked at all. However, they might help! This guide will focus on using commuter trains in the Tokyo area. Thus, the examples will be based on stations and trains used in the city, and shinkansen will not be covered as they are not technically commuter trains. The metro part of this guide will also only cover the system as it exists in the Tokyo area. If you go out of Tokyo, there are different subway systems, like the Yokohama subway and the Nagoya subway. However, the process of buying a ticket, getting on the train, buying a pass, etc all remains largely the same. You may wonder if there is a way to travel through cities in Japan by means other than trains. There are two choices: you can walk or you can take taxis. Honestly, walking through Tokyo is not bad if you are staying in the city centre. You can walk from Shibuya to Ebisu in about 12 minutes. You probably don’t want to walk from Mitaka (where the Studio Ghibli museum is) to Shibuya, though, because that takes 3 hours. Taking a taxi can be more convenient than taking trains, and in some cases faster, but cab fares are relatively expensive in Tokyo, and if you only use taxis to get from one place to another you’ll find that most of your budget will be spent on transportation. Going from Nakano to Koenji by train, for instance, takes 2 minutes and costs about JPY140 (approx. SGD1.6) or so. Taking a taxi from Nakano to Koenji takes about 10-15 minutes and can cost up to JPY2000 (approx. SGD22). Needless to say, taking the train is part of the Japanese lifestyle and it is a fantastic way to experience what it feels to live in Japan. 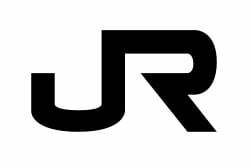 JR stands for Japan Railways. There are several branches of the Japan Railways Group depending on the location–for instance, Japan Railways East (JR East) covers Tohoku and Kanto, where Tokyo is. 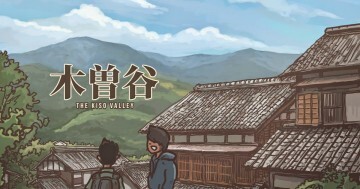 Likewise, JR West does Kansai and JR Kyushu does Kyushu. How do I get to the JR station? If you are staying in a hotel or a hostel, they will most likely provide you with directions to the nearest train station. However, I put this question as a heading for a reason. Make sure you know if you’re travelling by metro or JR, and which line you’re using. Depending on the station, you may end up wasting your day trying to find out where you are supposed to go. Simply asking “where is Shinjuku station” or “where is Tokyo station” could land you on the opposite end of where you need to be, and by the time you get to your destination, precious time will have been lost. If you are inside the station, there will be signs pointing to the location of the JR lines. Take note that if you arrive at the station by metro, you will need to exit the metro section – that is, insert your ticket or use your IC card to get through the ticket gates – before you reach the JR section. How do I buy a JR ticket? You can use them in English (unless you are at a very, very tiny station in the middle of nowhere) by selecting the button that says “English,” usually in the top left or right corner. When you approach the screen it will light up (unless someone was using it immediately before you, in which case it’s already active) and you will see boxes with numbers on the screen. These are the prices of the tickets. To figure out how much it takes to get to your destination, just look at the map. This map is usually located above the ticket machines and is a diagram of all the lines you can take from where you are and how much it costs to get to each station. 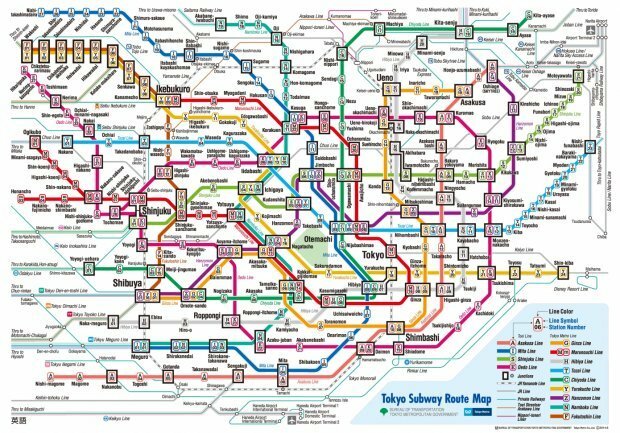 The station you are at is usually the biggest square on the diagram, and if you’re staying on the same line and you know how many stops you’re going, you can just count the squares in the direction (for example, towards Shinjuku station or away from Shinjuku station). If you’re transferring, you have to find the corresponding transfer line connected to the line you are currently at and then go from there. It sounds confusing, and it definitely will be the first few times you try it, but it gets easier. It’s also much easier to buy tickets at stations that are small and aren’t very crowded, so the map doesn’t have 128953847 differently coloured lines. Also, sometimes the map is only in Japanese. Don’t worry, you can either ask the information counter and they will gladly help you, or you can buy a ticket for the lowest price and just do a fare adjustment (covered in the next question) when you get to your destination. You can top up the difference then. Once you’ve figured out how much you have to pay, touch the box on the screen and follow the instructions (inserting your money). You can also select how many people you are buying for by clicking the buttons on the left side with the “people” icon. Ticket prices for children is lower, so you can adjust for that as well. You can also buy each ticket separately. What if I pay for the wrong ticket price? When you get off at your final destination, there will be a fare adjustment machine (called exactly that) by the ticket gates. 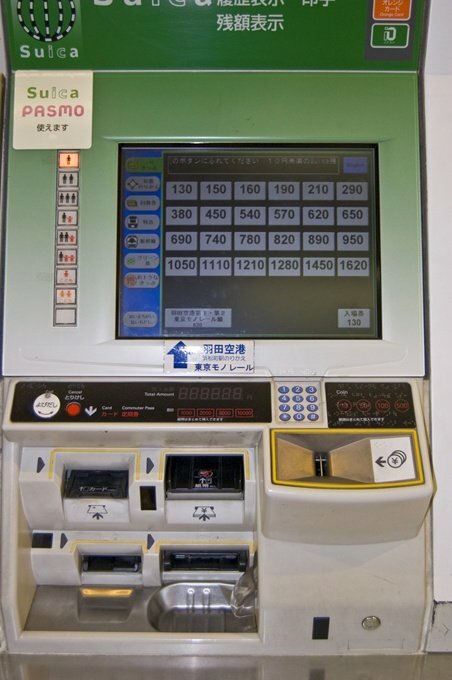 Insert your ticket and the machine will inform you how much you need to pay to adjust your fare. If you have an IC card (see below), you can also recharge your card at these machines if you don’t have enough in it to get through the gates. Can I buy a pass instead? Yes! 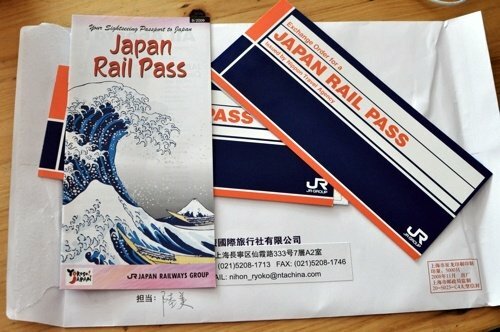 If you are travelling to Japan on a tourist visa – which is up to 90 days, so short-term exchange students may be on a tourist visa – you are eligible for the JR Rail Pass. You have to buy this before you get to Japan, as you are not able to get it within the country. It will be activated as and when you want it to – so if you are in Japan for two weeks, but aren’t travelling for the first week, you can activate it on your second week in Japan. What is this prepaid IC card you speak of? 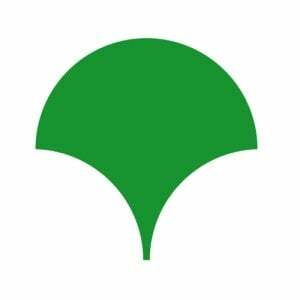 There are different IC “brands,” like the Suica and the Pasmo (bought in Tokyo for the JR and non-JR companies, respectively) or the Toica and the Manaca (Nagoya, same distinction) or Icoca and the PiTaPa (Osaka, same distinction). Basically, if you have a Suica and you ride the non-JR trains, it’ll be a little more expensive; if you have a Pasmo and you ride the JR trains, it’s a little more expensive. The IC cards of the following cities are interchangeable: Tokyo, Osaka, Hiroshima, Okayama, Nagoya, Sapporo, Fukuoka, Kumamoto, Kagoshima, Oita and Nagasaki. That is, if you buy an IC card in Osaka, you can use it for the trains in Tokyo or Sapporo. Yes, any train – doesn’t matter if it’s JR or subway. You can use IC cards on most commuter buses as well. You cannot use IC cards for shinkansen, special trains (such as limited express trains, which have special fees) and highway buses. 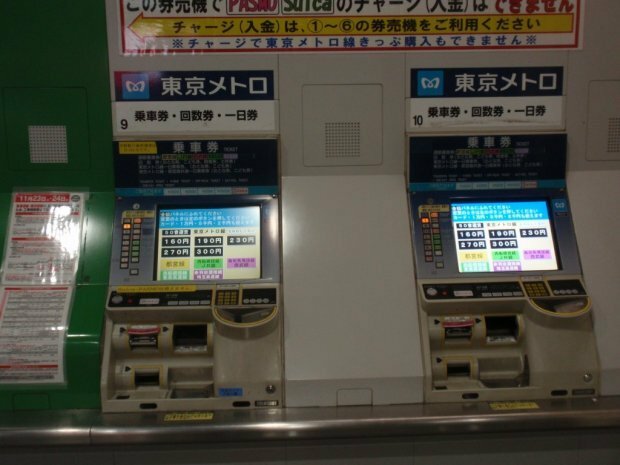 For Tokyo, Suica and Pasmo can be bought at ticket machines or counters in stations. 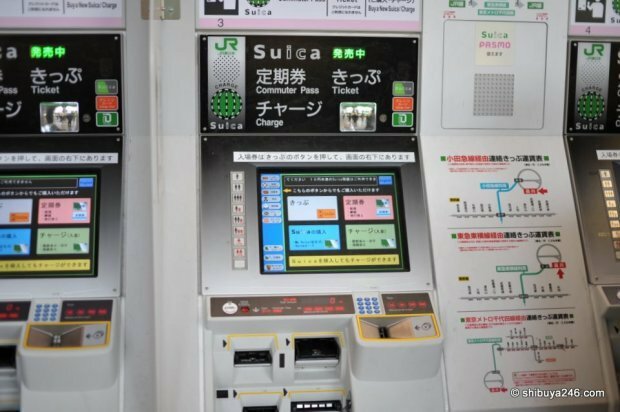 For the machines, it has to say that it will dispense Suica or Pasmo cards (Suica and Pasmo are both Romanized, so you will be able to see this on the machine itself even if it’s in Japanese). 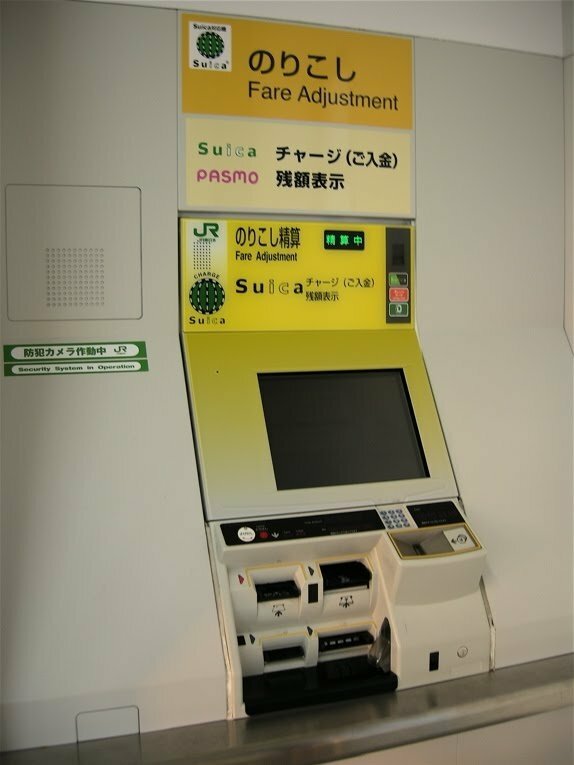 When buying your first Suica or Pasmo, you will be charged a fee for the card as well as for how much you initially load it with. This brings me to explaining how to charge your card. You can do this at any ticket machine. It doesn’t have to be specifically for Suica or Pasmo. Insert your card into the slot (it usually has a blinking red light next to it), and a menu will come up with options. Select “charge.” You will usually only be able to charge your card in increments of 1000, but some machines let you add just JPY500 (approx. SGD5.6). Insert the money and the card will come out soon after. IC cards can also be used to shop in convenience stores with the same touch-and-go technology. 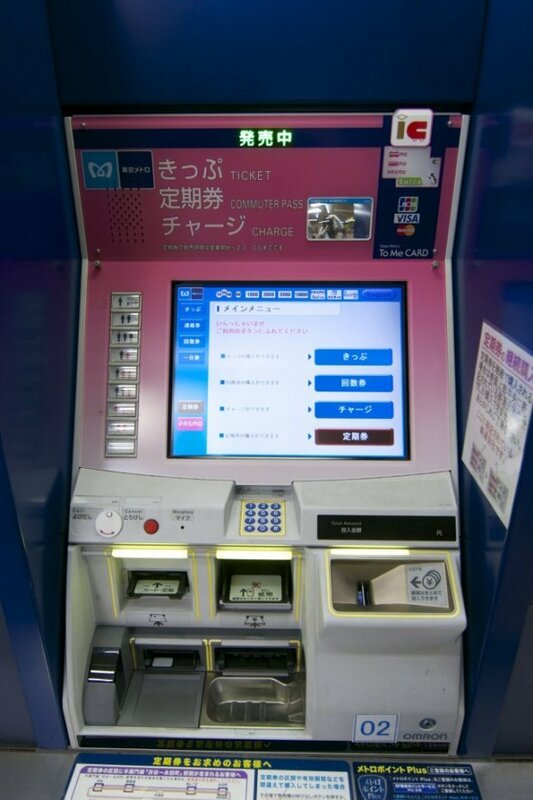 Some other places may accept your IC card as a form of payment as well. You have to charge the card at stations, though; you will not be able to add money elsewhere. How do I change trains for the JR? When you get off your first train, immediately look for signs on the platform (hanging from the ceiling or on the walls) that will point you in the direction you need to go. The signs will usually name the lines or be more general, such as “JR lines.” In any case, just find out where you need to go and follow the arrow. Sometimes you will need to pass through ticket gates to get from one area of the station to another, especially if you are going from the metro to the JR lines, or one subway company to another. One thing to note here is that you have to know in which direction you’re going. 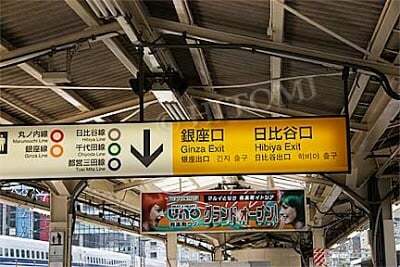 Sometimes the signs will say “Hibiya Line – to Naka-Meguro” and “Hibiya Line – to Ueno.” At certain points along the platform, there will be signs listing the stations on the Naka-Meguro side/on the Ueno side. But even if you get on the wrong platform, there is always a passageway to the other side so you can get to where you need to go. What’s up with all this express, limited express, super express, blah blah express business? Local (普通) – stops at every station. 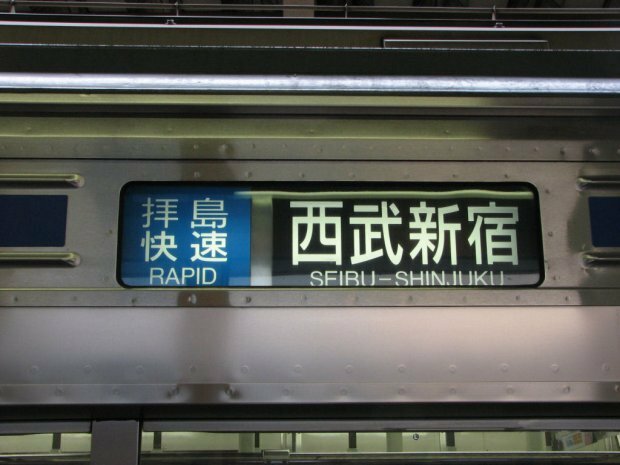 Rapid (快速) – skips some stations. Express (急行) – skips a lot more stations. The fee for these trains is higher than the local/rapid trains. Limited Express (特急) – only stops at major stations. Also requires an extra fare (sometimes as much as JPY4000 / SGD45). Your best bet is to stick to only the local and rapid trains (though if you’re riding rapid, make sure the train stops at the station you want to go to). Express and limited express trains can be tricky, though if you are going further out of the metropolitan area (or going into central Tokyo from far away), these might be better options lest you find yourself on the train for 2 plus hours. How do I know I’m on the right JR platform? Signs, signs, signs! You will be relying on signs a lot when in Japan, and luckily you’ll be looking at ones that are in English as well as Japanese. Platforms will usually have a station list posted on a pillar that denotes a) what line you are getting on, b) what station you are currently at (usually in bold and a bigger font size than the other station names) and c) which direction you are going. For the JR, you will have to eyeball where you’re going and if you’re going the right way. It’s a little easier to check the direction you’re going on the subway. The signs hanging above the platforms will also usually say the major stations you’ll pass in that direction. 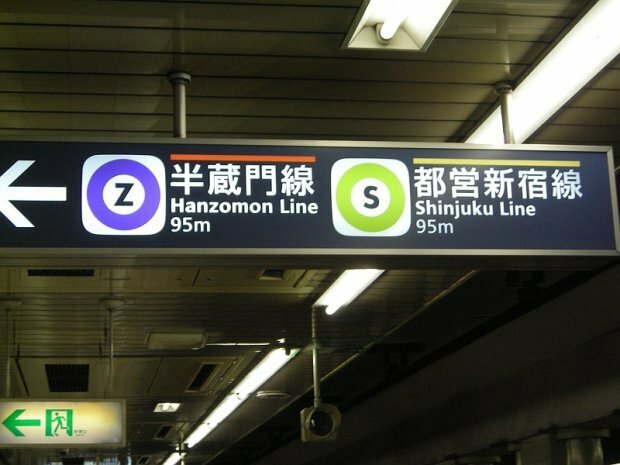 If you are going to a major transport hub like Shinjuku, Tokyo or Shinagawa stations, they’ll definitely be listed on those smaller signs. How do I get on the train for the JR? You probably think this is a really stupid question, but it may prove useful for you, so read the answer anyway. Once you pass through the ticket gate and you’ve found the right platform, you’ll notice that there are numbers on the opposite wall or ledge from the platform. These numbers indicate where the doors of each car will open, and so this is where people line up. The middle cars of the train are usually the most crowded, and your chances of finding a seat are higher if you’re in the first or last car. Of course, this also depends on what line you’re on and what time you’re taking the train. Finding a seat during rush hour, of course, is a very funny thought. Line up as usual. When the incoming train stops, you’ll have to wait until everyone has gotten off. This is sometimes really fascinating to watch, especially if the train is really crowded. Once you get on the train, move to the sides of the car to free up space in the middle. Yes, it might get very crowded, and you might find yourself in close proximity to strangers, but that’s train life. 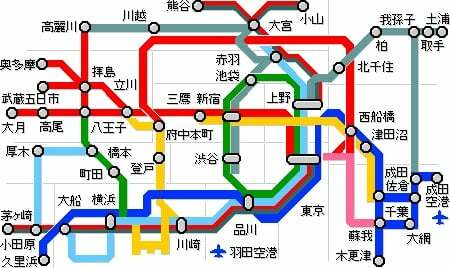 The subway system in Tokyo is divided into two companies: the Tokyo Metro and the Toei Subway. There is no real pattern, or any rules, as to whether or not you have to take one or the other, or if you can only take the subway and not the JR. You can mix and match to your heart’s content, or you can stick to only taking the JR, or only taking the subway. There’s not much difference between the two companies mentioned except for where they go and the prices (the Toei subway is a little more expensive). 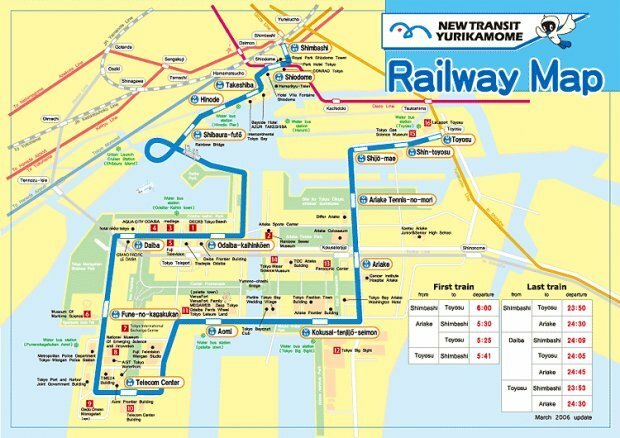 The Toei Subway, for instance, has the Asakusa line, which takes you to Skytree and Asakusa. The metro, though, goes to Omotesando. So it’s really all a matter of convenience. It is usually only denoted by the white “m” on the left side. It is not always the case that there will be both a metro and a Toei line at the same station. Likewise, it is not always guaranteed that a station will have both JR and metro, or JR and Toei. When deciding where to stay, it is advisable to choose a hotel or hostel near a station with several lines on either (or both) the JR or subway in case one is delayed. How do I buy a subway ticket? Buying tickets for the subway is exactly the same as buying tickets for JR.
Look at the map to find out how much it costs to get to where you’re going, select the button with the desired amount on the screen, pick how many people if you are buying for, insert your money and yay – ticket! 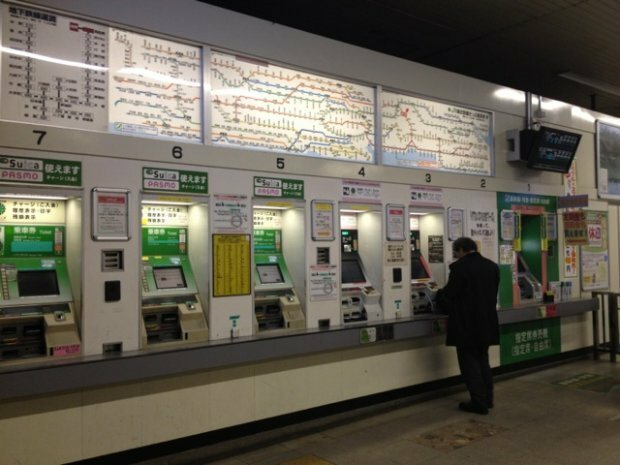 Just like with the JR, if you accidentally buy a ticket with the wrong price or need to recharge your IC card, you can do this at the exact same fare adjustment machines. Can I buy a pass/IC card for the subway instead? You can use the IC passes discussed in the JR section for the Tokyo subway. 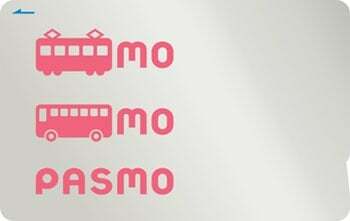 If you’re going to be travelling mostly on the subway, purchase a Pasmo instead of a Suica. How do I change trains for the subway? Changing trains on the subway is exactly the same as with the JR: simply follow the signs! 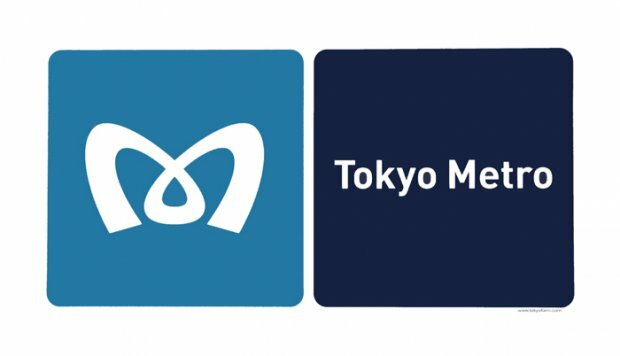 If you are hopping on another Tokyo metro or the Toei, there may be no need to pass through the ticket gates when trying to get to the other line. Changing from the metro to the Toei, or vice versa, you will have to go through ticket gates (this is also the same if you are changing to the JR lines). This isn’t anything that should trip you up, however. As long as you follow the signs – and follow them well, as they do get confusing especially in bigger and busier stations –you’ll find your way. How do I know if I’m on the right platform for the subway? Once again: signs, signs, signs! As with the JR, platforms will usually have a station list posted on a pillar that denotes a) what line you are getting on, b) what station you are currently at (usually in bold and a bigger font size than the other station names) and c) what direction you are going in. For the subway, these signs will usually be very big and will sometimes have the other side – i.e., the opposite direction that you’re travelling in – blurred out, or not listed at all, so you know you’re definitely going the right way. How do I get on the train for the subway? Again, getting on the subway trains is exactly the same as getting on the JR trains. 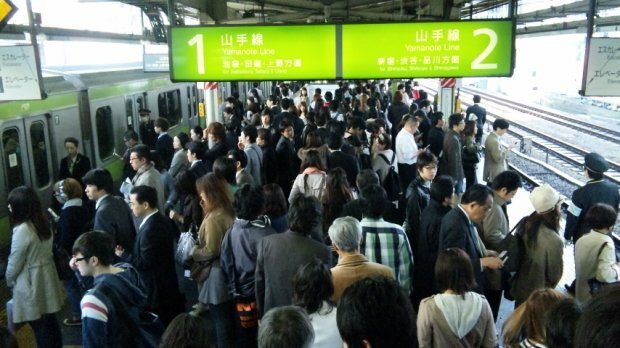 Be aware, though, that some subway lines like the Marunouchi or the Tozai can get EXTREMELY crowded during rush hour. 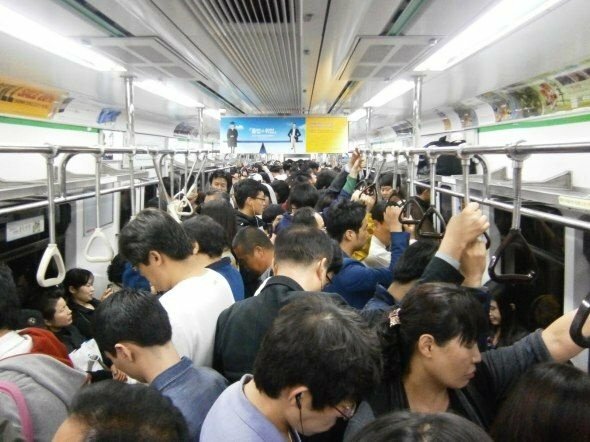 Just because it’s the subway doesn’t mean that it’s less congested than the JR lines. Does the subway have express trains as well? Yes, and they work exactly the same way as they do with the JR. Here is an example train “schedule,” denoting the steps that need to be taken to get from your initial destination to the end. 2. Find JR or subway section of station. 3. Find the area where your desired line is. 4. Find ticket machines near ticket gates (wicket). If you already have an IC card that is charged, you can just go through the gates at this point. 5. Buy your ticket or charge your IC card. 6. Go through the ticket gates. 7. Find the direction you want to go in, which corresponds to the platform you will be using to get on. 8. After you’ve found the platform, line up to get onto the train. 9. Once the train arrives, wait until everyone has gotten off the train before following the line into the car. 10. Move toward the inside or the side of the car to free up space near the doors. 11. Once you’ve gotten to your station, get off the car (no special procedure here) and proceed to the exit you want. A note about exits: There are usually multiple throughout a single station, and exiting at one can put you at the exact opposite place from where you need to be, so check beforehand! Tourist areas, restaurants and shops will usually denote which exit you should take on their website. 12. Head toward the ticket gate (wicket) and insert your ticket or touch your IC card. Do fare adjustment first if you need to, and then exit. 11. Once you’ve gotten to your station, get off the car (no special procedure) and look for signs denoting where you need to switch to your new line. 12. Follow the signs. At some point, you may or may not need to pass through a ticket gate (wicket). 13. Once you’ve reached the platform you need, line up again and wait for the next train. 1. You only covered JR and the subway. What about the Keio/Tobu/Denentoshi/Yurikamome/etc. lines? Since the JR and the metro are the main trains used within the Tokyo area, I only covered those. However, there are other privately operated train lines such as the ones listed (and many more). Their operation, however, is pretty much consistent with the JR and metro. 2. Is rush hour really as bad as everyone says? The peak of rush hour is pretty bad. There really are helpers on the platforms to help squeeze everyone into the cars, and once inside the car, it’s pretty packed. You’ll be squeezing with and pushed against people you’ve never met in your life, and chances are, you won’t be able to raise your hands to look at your phone or change the song on your iPod. The good news is that many people drop off at major stations, so you’ll be able to move again if you’re not getting off with them. 3. What is this jinshin jiko business? Jinshin jiko literally means a “personal accident” and contains the kanji for “oneself” and “person.” Basically, when there is a jinshin jiko on a train line – which happens quite a bit in Tokyo – it means a person caused a disturbance of some kind on the train tracks. This could be anything from someone accidentally falling from platform onto the tracks to suicide. 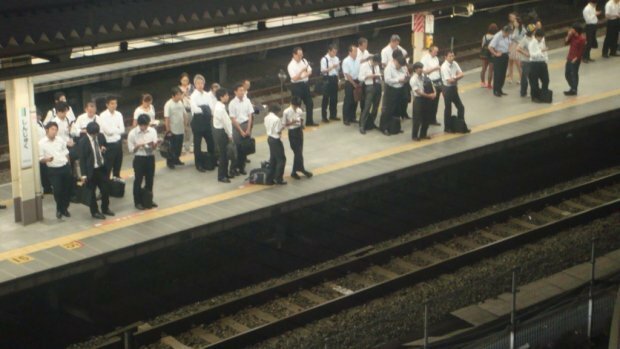 While you may have heard a lot about train suicides in Japan, the truth is that most jinshin jiko occur because of people who accidentally fall onto the tracks, due to overcrowding on platforms or them being drunk. This is why at a lot of busy stations and/or busy lines, there are automated barriers between the platform and the train tracks which remain closed until the train arrives. 4. What are other reasons trains get delayed? Besides jinshin jiko, trains are sometimes delayed for surprise maintenance or because of other mechanical check-ups or problems. 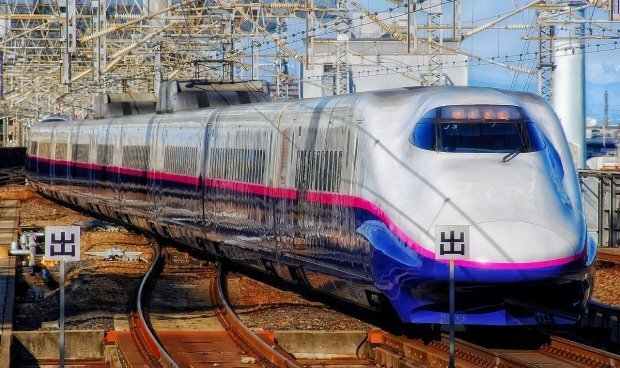 When a train is delayed, you can expect that the company will do its best to get that part of the line working up to full speed as soon as they can – this is Japan after all. If your train line is delayed, don’t worry. Wherever you’re going, there’s probably an alternate route. Ask a conductor, the staff at the information counter, or even someone just waiting around on the platform. If your train line is halted altogether and you have no alternative available, it might be best to take a taxi instead. 5. All the train lines have similar colours! How do I tell them apart? I feel you. The sad news is, if the colours are too confusing, you’ll have to rely on the station names. It’s a good idea to write everything down BEFORE you get on with your day’s activities, so you know exactly where you’re going. 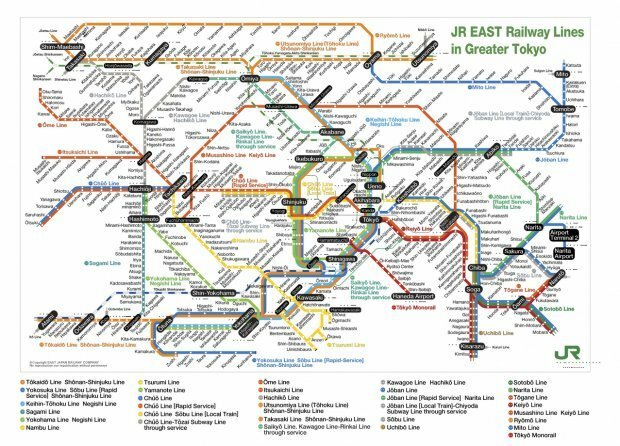 Saying to yourself “I need to take the orange line” is not a good idea, because if you’ve seen the Tokyo train map, there are about fifty bajillion lines that could be orange. Did you mean light orange? Or gold-y orange? Or deep orange? Or burnt orange? Save yourself a lesson on colours and write down the name of the line instead. You can also invest in a map, which are available at most stations, and a pen. 6. Will I be safe on the train? Generally, yes. Contrary to what everyone might tell you, Japan is not a ridiculously safe country. However, it isn’t ridiculously ridden with crimes, either. The rules of being a smart tourist apply in Japan just as much as they do anywhere else. Don’t flaunt what you have, make sure your wallet is in a safe place close to your body, don’t leave your belongings unattended, etc. 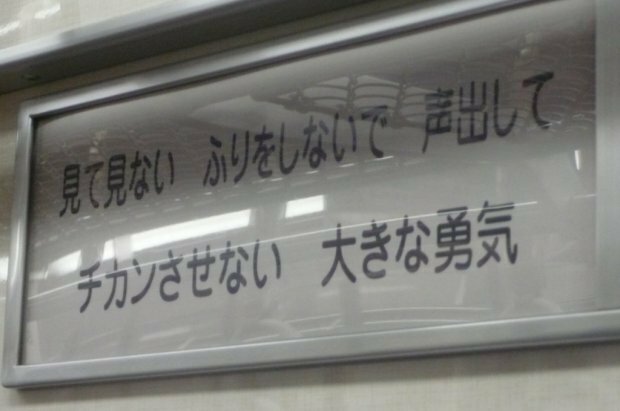 You might notice that there are signs (like the one above) in stations reminding passengers to be on the lookout for chikan, or perverts on trains, and to let out a courageous yell if anything happens. Things like perverts who groping and use secret cameras were much bigger problems back in the days, but this doesn’t mean that it doesn’t happen at all now. Again, just be alert. 7. What if I leave something on the train? If you forget something on the train, go to the main office at your nearest train station and explain your situation. They might ask you to go to the office at a major train station, but not all hope is lost. Don’t worry too much about the language barrier, either. If you can’t speak Japanese, there will most likely be someone at the major station who will be able to communicate in English to help you sort out your problem. 8. Can one train line change into another train line? Yes, they can. At first you might think this is very confusing and you will probably hate it, but once you get used to this, you’ll find that it’s a great way to save time. Lines that go to Haneda and Narita airports often begin as metro lines and there are “add on” stations to service those areas. Basically, one train line can service another in order to accommodate more customers. An example of this is the Tokyo metro Tozai line. E) The rapid service to Mitaka, which goes from Toyo-Katsutadai to Mitaka and begins as the Toyo Rapid Line and merges into the JR Chuo line. This can either run as a rapid train or as a normal train. Likewise, all of these variations can go the opposite way. You can get on at Mitaka and go all the way to Toyo-Katsutadai or to Nishi-Funabashi and anywhere in between (unless you’re on the rapid). 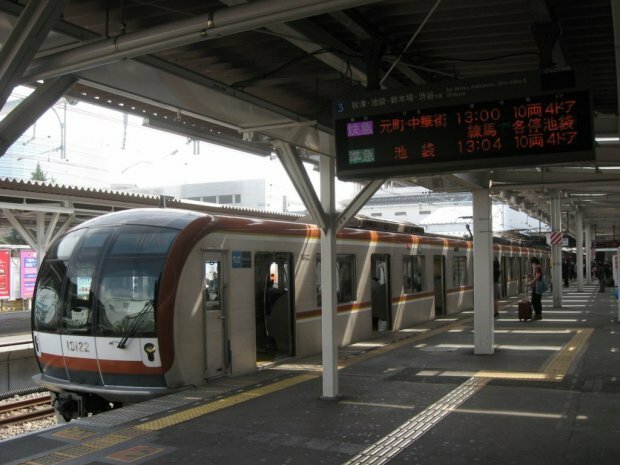 Take note that even though the line is referred to as the Toyo Rapid Railway, it is not always rapid – that is, sometimes it operates as a normal train and stops at every station. Confusing, right? Don’t worry too much about it. If you do your research in advance, you’ll be able to save time and the energy by switching trains. Don’t feel compelled to do this for every train you get on. If you want to do this, you will most likely need a map to make sure you’ll definitelly reach the station you need to get to. 9. Are there apps I can use to navigate the train system? Yes! And they are super useful! Please note, however, that some features on these apps require Wi-Fi to work. If you are renting a smartphone in Japan, you should be fine, but if you are planning on using your own, you’ll have to depend on Wi-Fi. Wi-Fi in Japan is very scarce, although there is free Wi-Fi on the subway (not yet on the JR). However, the Wi-Fi situation is pretty complicated. For the Tokyo metro, there is Wi-Fi at every station and every line, but the signal is pretty weak and sometimes you will have to get through several windows in Japanese before your phone can actually connect. For the Toei subway, there is Wi-Fi for all the stations on the Oedo and Shinjuku lines, but for the Asakusa and Mita lines, only some stations have Wi-Fi. In short, I wouldn’t rely on the Wi-Fi on the trains, but it’s there (sometimes) if you need it. If you need a strong Wi-Fi signal, your hotel/hostel will definitely have one, and many coffee shops usually have good (and free) networks. 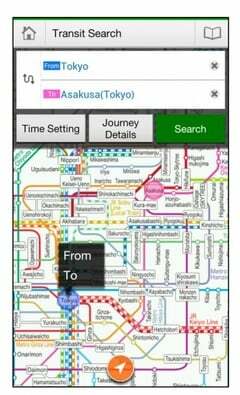 This might be the only app you need while travelling around Japan. NAVITIME not only helps you figure out the train routes, it has an offline feature that looks for a free Wi-Fi spot in the area you are currently in. It also gives you information for buses, the subway, the JR, other trains, and pedestrian routes. It will give you a price estimate for taxis and provides train maps. It even gives you ideas for things to do in Tokyo if you’ve run out of places to see. This app is solely for riding on the metro. It can be used offline and used in Japanese, English, Chinese or Korean. It provides train maps, schedules and routes for the metro. 10. What are women-only cars? 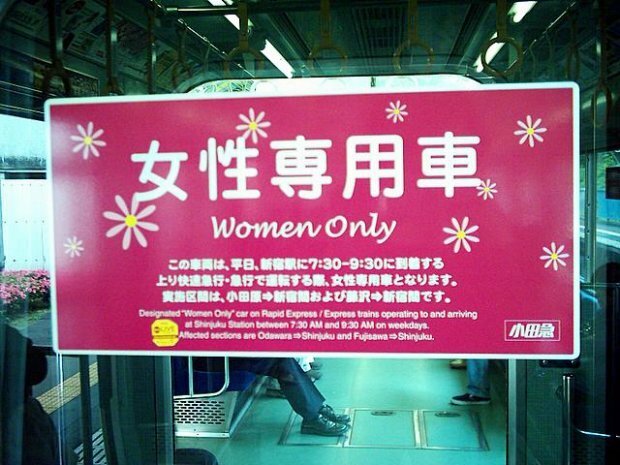 Women-only cars are exactly what they sound like: cars of the train reserved only for women during the morning and evening rush hour times. You will be able to tell a women-only car from a giant sign (usually pink) either on the platform or inside the car. If it’s not rush hour/the time frame denoted on the pink sign, and you are male, you are allowed in the car. If a man enters the women-only cars during rush hour/the time frame on the sign, he’ll be fined a ton of money and shunned forever. Technically, you are not banned from entering the car if you aren’t female. You can get on. But you will be given some really dirty looks and even scolded aloud. By law, you can also be fined (though this isn’t really enforced, and the fine is only JPY10 / SGD.11). So just don’t do it. Also read: How Much Do You Really Need For Japan? 11. What is basic train etiquette? One of the most important things to remember on the train is that it isn’t your living room. 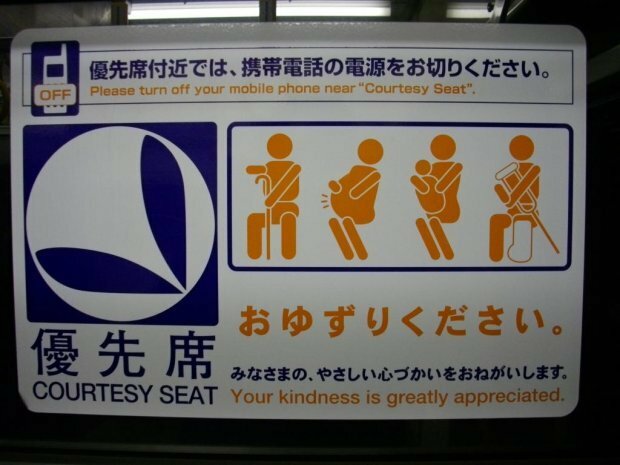 You may have heard that it’s rude to talk on the phone while on the train, and this is true. If you have to, just don’t use a loud voice. Keep your belongings close to you, and don’t shove your legs towards the centre of the car such that everyone has to step over them. Don’t eat on the train either, but if you must, then don’t wave your food around or make a mess. Keep the music in your headphones at a reasonable volume (though this isn’t so much a problem when the train isn’t crowded, it’s more for the person next to you). Have common sense. If you can hear the music of someone all the way down the car, or if someone is having a really loud conversation on the phone when everyone else is quiet, then you know how annoying that is. Also, make sure you actually take note of the priority seats! It’s okay to sit there when the train isn’t crowded or if you’re really tired and there’s no one around who needs it. But if an elderly person or a pregnant woman gets on, or someone with crutches – anyone who needs the priority seat more than you do – then please move. Pregnant women in Japan are given a keychain (a “maternity mark”) that they usually hang on their bag to let everyone know that they need a seat on the train, so you will know when you should give up your seat. That’s it! Keep these tips in mind when you opt to explore Japan by train. 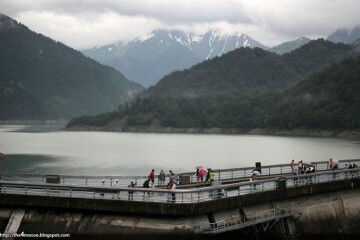 tsunagu Japan is an information platform made to transmit Japanese culture to the world. Our carefully selected authors introduce topics such as anime and manga, entertainment, fashion, and other pop culture items as well as traditional culture and cuisine, tourism and sightseeing information, and more. We want to bring all of Japan to you.